Organised golf has been played in this part of the Scottish Highlands for well over a hundred years with Golspie Golf Club formed in 1889 – twelve years after Dornoch, one year before Tain and two years before Brora. 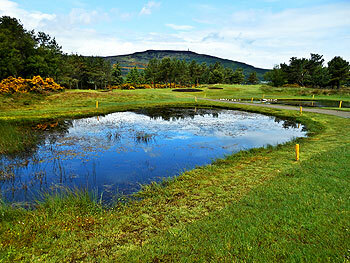 Unlike these other three neighbouring courses, the terrain at Golspie is not exclusively links in nature. The course routing sets out over meadowland, quickly turns back as links along the Dornoch Firth for several holes, veers away from the shore into tree-lined heathland around the turn then returns to parkland and links by the end of the round – quite a combination! There are birdie opportunities early in the round at the 493-yard 1st hole, named “Backies” and at the 522-yard par five 4th hole, named “Gully”. However, you’re well advised to leave your second shot at the 4th short of the small valley in front of the green – the ball may be playable on the right side but there is heavy rough on the left side and any shot out of here will be played blind to the green. An interesting pair of short par fours – the 288-yard “Sahara” and 285-yard “Fleet” – are played immediately before and after the par three 6th hole, called “Saucer” then the course enters its heathland section at Ferry Wood, which was laid out by James Braid in 1926. Holes 8 to 10 are located here at the furthest point to the clubhouse and they form a lovely loop, bounded by tall pine trees and deep heather rough. Holes 11 to 14 are all played over pastureland beside the road that runs down the left of each fairway. The 15th turns back, away from the clubhouse before an old fashioned golfing quirk is chanced upon – back-to-back par threes! “Cairngorms” is the 175-yard 16th hole played to a tiered green with magnificent views across the Firth and Tarbat Ness. It is followed by the 211-yard “Sahara Back” 17th hole which is often played short right by members to avoid sand and rough surrounding the green. A pitch and putt on the large, level green will often result in a par score at this hole. At a touch over 6,000 yards in length, Golspie does not intimidate the visiting golfer in terms of yardage from tee to green but it does ask a fair number of strategic ball placement questions around the course so keep your thinking cap on when playing here. Walking off the 1st tee at Golspie towards a featureless, flat fairway it might not be immediately apparent about all the golfing goodness that lies in store and just how terrific it is… but by the time you have reached the turn you are acutely aware of the spectacular nature of this fascinating and varied links. Golspie may not be love at first sight but it is likely to be an everlasting relationship. James Braid has once again come up with the goods at this fun, and at times quirky, hybrid links course. From the moment you play into the first green until the time you walk off the exceptional ninth you are in golfing heaven. It’s a stretch of golf that will truly delight. At times it is a rollercoaster ride with shades of two of my other favourite courses; Perranporth in Cornwall and Tenby in South Wales. The land, particularly on the holes that hug the coastline, is simply made for golfing. Holes two to seven are as linksy as they come - genuine, authentic linksland - before we move into a heathland section of the course which is still in close proximity to the sea and is certainly linksland in my eyes, albeit the holes are lined with heather and pine. Holes 8 and 9, the latter in particular, are first-class holes. The ninth requires you to shape the drive from right-to-left before playing to a green which is protected by a large depression towards the front-left. It’s a hole that could be placed on many a top golf course and only improve it further. The inward nine doesn’t quite match the highs of the front-nine but there is still plenty of good and strategic golf to be played, albeit over less linksy land. The diverse terrain is what makes Golspie so special and stand out from other courses. Despite it having moments of heath and a spell of more meadowland on the inland back-nine I would still class it as a links overall. It doesn’t feature in the book ‘True Links’ but there are several courses included in the publication that aren’t a patch on Golspie for linksy-ness! With so many top courses in the Scottish Highlands it is easy to overlook a visit to Golspie but, in my opinion, that would be a big error. Golspie was part of the itinerary for our Highlands golf break and one e best decisions we made was to play here. We arrived on the last Tuesday in June to overcast skies and strong winds. Walking on to the first tee the course was deserted and for the entire round, apart from the green staff, we had the course to ourselves. This truly is a gem. Even when a short down pour drove us off the course after the 14th t did not spoil the enjoyment. We had a break in the clubhouse for a sandwich and a pint and then returned to the 15th tee to finish our round. For me the early holes along the beach were the highlight with great views across Dornoch Firth. Keeping it straight, not my forte, is needed here, length does not always help. Get a course planner, look at what lies ahead, chose your club and pray you hit it well. After a straightforward opening par 5 the course turns towards the sea with a 160 yard par 3. Into the wind I had to flush a rescue club to reach the green. There is then a run of 3 holes right alongside the beach on the left. However, if you bale out to the right you can be in nearly as much trouble. Our group loved this course and are already talking about a return next year. Finally got to play Golspie in early April on a very wet and windy afternoon when not only were we the only people playing, we were the only people at the club ! A nice straight forward opening few holes followed by some strong holes along the beach, then cutting across to avoid the omnipresent Scottish static caravan park and heading to the far end of the course and the more heath land feeling holes. Really like Tinkers camp hole, then we had a run of strong par 4s back into the northerly wind. The finishing holes were in a mini loop and very hard with the wind conditions. The course reminds me of Monifieth in its mixture of holes and quality. It's easy to overlook Golspie when compared to Dornoch, Brora and Tain but this would be a mistake, it's an excellent course in its own right.4.5 rating if I could, but it's too good for a 4 ! Possibly the most under-rated course in Scotland. The mix of holes between links and inland should not detract from the fact that both the links and and inland holes are fantastic! Holes 12 to 15 are slightly less interesting than the rest of the course, but altogether a thoroughly enjoyable course, with the bonus of 3 hour or less for a round as opposed to the 5 hours you get for some of the more famous courses in the region. What I remember most when thinking back to the day I played Golspie was the easiness of the atmosphere. I think of a most friendly chat in the pro-shop, the kids that played video games on the TV screen in the clubhouse while their fathers drank a coffee and just enjoyed their good company. I just felt kind of home there. The course itself was fun. No touch of greatness, but due to the varied terrain a special experience nevertheless. I personally would rank Golspie a tad behind Tain and F&R but in front of Nairn Dunbar. And then again it simply doesn’t matter. All of them are definitely worth a try. Golspie provides an interesting mixture of links and heathland. Situated between Dornoch to the south and Brora to the north, the course provides wonderful views of the Dornoch Firth and Ben Bhraggie with the statue of the first Duke of Sutherland at the summit. The first six holes are in the flatter more open part of the course with 3, 4 and 5 running right along the beach. From the 7th hole the course moves towards the holes featuring heather and trees, however the fairways keep a true links feel. Several holes from the 9th are known as ‘paradise corner’. The 9th in particular requires accurate hitting to stay out of the heather on the 412-yard par four. The 10th is a most attractive par three, ‘Locky’, with two small ponds, heather and bunkers making the 148-yard sloping target seem just a little smaller. Twelve and thirteen are two further par fours needing straight hitting. The 14th is currently a par four of 425 yards but this may be lengthened to a par five in the future. The remaining holes are in the open around the clubhouse. Whilst 16 and 17 are back to back par threes, 18 is a tough finishing par four of 335 yards. I'm not sure that visiting groups like ours always include Golspie on the itinerary, but I'm glad we did. The course and clubhouse are modest, and more attractive because of that lack of pretention. We were fortunate to play on a beautiful day, mild and relatively calm. The course was there for you, but only if you found fairways and greens. The wet spring resulted in juicy rough that was best avoided. The greens were very good. The holes that move away from the sea are not as much fun as the sea side holes, but are challenging and attractive. In short, our group loved the course, its views and the hospitality accorded to us. On arrival at Golspie, making your way down the largely single track road, you see the links holes and know that you’re in for a treat, although the lovely lady in the pro shop lets you know about the mixed character of the course. We set off under grey skies with the odd ray of sunshine peeping through and experienced a mixed bag of weather thereafter. The wide open first offered up a welcome par from tow putts on the good quality putting surface. The seaside holes are genuine links fare with a cracking par3 second and a meaty par5 fourth complete with semi-blind approach, especially if you play well to the right, to avoid the lateral water hazard of the North Sea. The par3 and short par fours that follow are charming and act as a gradual transition to the more heathland holes (8-11) which are as picturesque as anything you will find in a coffee table golf book. The 9th plays as tough as it looks with its crowned, snaking fairway eager to throw off shots into the heather before an approach aimed at the rear marker post. The only time the course feels anything like a letdown is when the holes become more parkland (holes 14 and 15), either due to the drop in quality to what has gone before or just because they look so out of place. The finish is strong with back-to-back par3s especially the 17th which plays longer than one might think, followed by a strong par4 over the crest of the hillock. I would conclude simply by saying well done and thank you to all those who nominated this course for inclusion in the top100 rankings. You are golfing connoisseurs who enhance this website in helping others to discover great courses. Golspie might be considered the 'wee brother' of Dornoch, Brora etc but it's actually a really cracking golf course in its own right. Don't be fooled by it being only around 6,000yds on the men's card as it'll test your course management for sure. Whilst the 1st, 14th and 15th may be a little bland off the tee, they lack some definition, their green complexes are pretty cunning (as are all the green complexes if you study them carefully) and the rest of the course is, well I reckon, just terrific, and great fun. The 2nd to the 6th are links holes and play mostly along the beach with many humps and bumps and several blind shots. From the 7th tee through to the 13th green the holes turn inland and have a more heathland feel, and good holes they are to, especially the 420 yd par 4 9th, a hole of such high quality it wouldn't be out of place on any of the UK's premier heathland courses. Holes 16 and 17 are tough par 3's and the finishing 18th hole is a long par 4 with a huge mound 80 yds short of the green. Pot bunkers abound at Golspie and when I played it a few weeks ago the course was, in overall terms, in excellent condition. But for me the standout feature was the wonderfully surfaced and true rolling greens - they were as good as any I've putted on in the UK, and that includes many expensive premier clubs and Open venues.......and Golspie only has 3 greenkeepers. This is an extremely relaxed and unpretentious club (and place) with a wonderful feeling of peace and tranquility about it and with staff who couldn't have been more friendly and helpful. Great scenery as well. Play it if you're in the area and hopefully, like me, you'll be very pleasantly surprised how good and how much fun 'little brother' is (great value £££ wise too). When one of the golf magazines recently compiled its inaugural Scottish Top 100 chart, I noticed I hadn’t played four of the ten courses on that listing that are currently unranked on this website and Golspie, at number 63, was the highest placed of this quartet – only one thing to do then, of course; make the 450-mile round trip from Glasgow in order to satisfy myself that this course truly has what it takes to make it into the ranks of the national Top 100! The opening 6 holes are a links delight with the rumpled fairways of the 3rd to the 5th hugging the coastline. The routing then turns inland to the raised ground around Ferry Wood and these heathland holes are surprisingly good. The 9th, “Paradise,” is an excellent par four that’s well worth its stroke index 1 rating and it reminded me of the type of hole you might find at the likes of Formby – same sort of undulating, springy fairway that’s bounded by heather and plays to a beautifully raised green with a wooded backdrop. I know another reviewer has mentioned this part of the layout would not look out of place at the celebrated Hotchkin course in Lincolnshire. Well, I’ll echo that sentiment as I too loved this stretch of holes and they really set Golspie apart from most typical Scottish links courses. After playing alongside Ferry Road from the 11th to 14th, the course makes a move towards the coast for the closing holes and the back-to-back par threes at 16 and 17 are excellent, particularly the former with its wonderful two-tiered green. Unlike other reviewers I rate Golspie highly - most definitely a 5-ball course. The par 5 opener is somewhat bland (but very tough into a strong wind) but the par 3 2nd is a cracker with a very sloping green. Of the next stretch special mention goes to the fine par 5 4th and pretty par 3 6th. Golspie really comes into its own at the famous heathland loop from 8 - 11. These holes would grace any inland course, yea even the mighty Woodhall Spa. The par 3 10th with its water feature is just wonderful. There follows a rather bland stretch before the fine par 3 16th. The last two holes can only be decribed as 'challenging' (back into that north wind again). Golspie is one of 5 courses available via the Dornoch Firth Golf Pass which costs £30. You then get 30% off the green fee at Royal Dornoch, Struie, Brora and Tain as well as Golspie. An excellent scheme and Golspie fully merits its place in that exalted company.